August 26, 2018 we have a lovely Full light of the Moon in Pisces to see the future with 3D glasses and harmoniously to feel and organise our dreams. The psyche Moon in Pisces will project the practical light of the Sun in Virgo that loves to work with details. Uranus in Taurus inviting us to break rules to let the future happen. 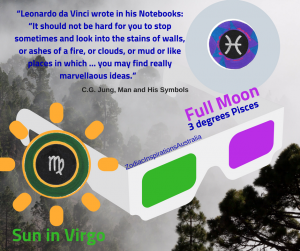 Full Moon at 3 degrees of Pisces -, 26 August 2018 @ 9:56 am – Remember to reflect on the past using positive memories to merge them with the present to create a harmonious future! Crystals, oils and aromas will help us to connect with this lovely energy. I got so many insightful messages that I would like to share something you. And everyone wants to shine so, let others to have the opportunity to shine! Always there is a solution. In the movie everything wrong happened and everyone in the team worked to make the event successful! The Moon rises in Sydney at 5:16 am – Share photos and Have a happy Full Moon!! !